Any Idea How much are Shutterstock Photos? Are you looking for a stock photo website that offers high quality images at simple pricing? Shutterstock is the perfect solution for your creative needs and budget. It has over 80 million premium content in its library, with over 500,000 more uploaded every month. It also offers free photos and vectors every week. By creating a free browse account, you will surely find everything you are looking for. Subscribe to any plan; and, the only thing you have to worry about is downloading. Number of images. 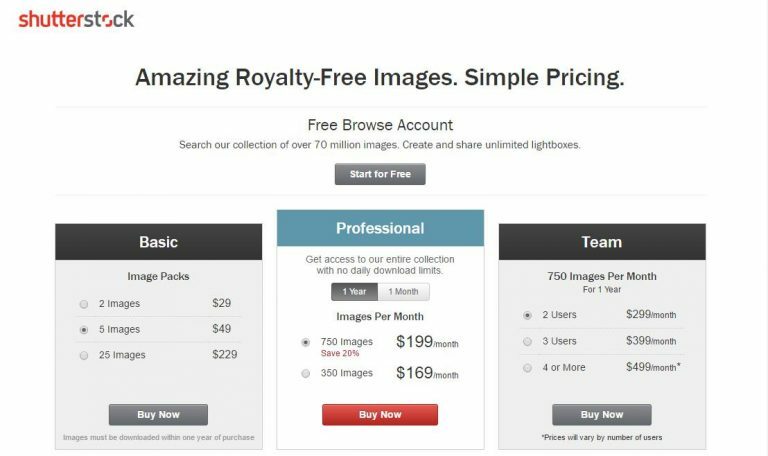 Whether you are purchasing an image pack or subscribing to a plan, the number of images included in packages and subscription determine the price you will have to pay. With image packs, you can purchase a minimum of 5 images for $49. On the other hand, subscriptions are available in 350 and 750 images only. Type of Plan. This applies to the subscription plans only. There are two types of subscription plans: yearly and monthly. Monthly plans cost more than the yearly plan; thus, we recommend the latter if you have consistent creative needs. Monthly plans start at $199 for 350 images, while yearly plans start at $169 for the same number of images. For 750 images, monthly plans cost. On the other hand, yearly plans is only at $199. Number of Users. This is applicable to Team plans. Team plans are suitable if you are working with a team. Prices start at $299 per month for 2 users. For every one user added to your team, you will pay one hundred dollars more, too. Team plans features 750 high quality images every month. Type of License. All three – image packs, subscriptions and team plans – include a Standard License. It allows you to use the images in any project for as long as you like. However, it also has its limitations. To fill those up, you need to get an Enhanced License plan. This plan includes images that you can use for over 500,000 print runs, for TV, online, video and film, and for merchandise for sale. Prices start at $199 for 2 images. Shutterstock offers incredible stock at simple pricing. It has a vast collection of high quality images, graphics, videos and music. With hundreds of thousands more added every month, you will surely find the perfect images for your creative projects. Now, you have an idea how much as Shutterstock photos, create a free browse account and purchase images packs or subscribe to a plan now! Download instantly to jump-start your creative projects. Copyright © 2019 Mel C Lark Photogprahy.